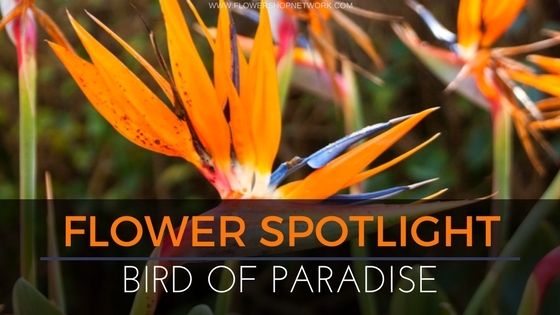 Birds of Paradise are native to South Africa. There is a total of 5 species of this perennial plant that make up the genus Strelitzia. They are referred to as the ‘bird flower’ because of the resemblance they have to a bird taking flight. The flower symbolizes excellence, success, and optimism for a bright future. So, if you’re looking to give someone a present of congratulations, an arrangement with this stunning bloom is the perfect choice! Bird of Paradise plants can grow over 5 ft tall. You can find this flower in the colors white, yellow, orange/blue, and red. This stunning bloom is the official flower to celebrate 9th wedding anniversaries. Birds of Paradise can be toxic to dogs, cats, and horses. This is according to the ASPCA. The Bird of Paradise plant blooms from September through May but can be found any time of the year. They make wonderful tropical centerpieces, beautifully adding elegance and a pop of color to any space! Contact your local florist today for availability. If not in stock, they can most definitely order it from their wholesalers.